One Bedroom Show House gets the ‘BB’ treatment..!! The challenge with “Styling to Sell” a small property is evident, there is simply little time and space to waste. The impact of a show house has to be immediate, the design has to be cohesive and functional…. We used clean lined contemporary furniture designed to very much suit the target market. We introduced dramatic pops of colour to add depth and points of interest to draw the eye. The colour palette selected here is “Bold and Bright” for the BB factor, contrary to popular belief small spaces can provide the ideal canvas for an expressive and visually stimulating design scheme. The balance between the hot colours is achieved with the grey kitchen cabinets and the charcoal cotton weave upholstery the sofa. The tall legs on the shapely sofa and the hot orange chair not only lend an on trend Mid-Century styling vibe but also accentuate the floor giving the clever illusion of more space, a trick that is definitely worth remembering! Fabric, rugs and accessories are a great and cost effective way to change the feel and style of a room. A bright rug can instantly ‘lift’ a room, and fresh vibrant cushions can liven a sofa. The one and only bedroom in this project situated on the ground floor is compact with lots of natural light. We choose mirrored furniture for a touch of glamour. The added benefit is that the projected refections create an illusion of depth of space and bounce the light around the room. This was further emphasised by using mirrored frames on the artwork. The bed styling was designed to have the boutique hotel luxury feel with a tall rich linen buttoned headboard and beautiful taupe velvet base throw. By adding a shot of hot pink colour onto the neutral base this adds another dimension and depth to the design. 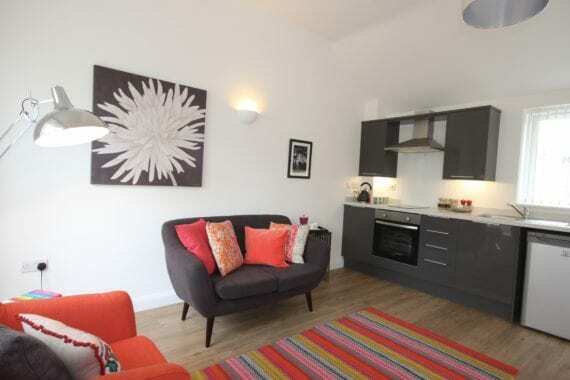 One Bedroom show house bright bold colours ensure that we achieve the WOW factor.